From “Primary Days,” Ensign, Apr. 1994, 65–68. I was a boy during the Great Depression. I remember children wearing galoshes because they had no shoes and going hungry because they had no food. These were difficult times. A bright light of hope shining amidst the gloom was Primary. I was 10 years old. I had a marvelous teacher. I look back upon that year as my finest in Primary, and I must say it was because of my wonderful teacher. It wasn’t because the boys in the class were particularly enlightened or unusually well behaved; on the contrary. The laughter of the boys and the chatter of the girls at times must have been most disconcerting to our Primary leaders. What I didn’t know then is that I was one of those responsible for her tears. She had effectively enlisted me to aid in achieving reverence in our Primary. And we did. When President Monson was young, 9- to 11-year-old boys in Primary were known as Trail Builders. The girls were called Home Builders. You Can Be Reverent Too! Even though he was just one boy, President Monson helped make his Primary a more reverent place. Think of three ways you could help do this in your Primary. Write your ideas below, and then try them. See what a difference you can make. 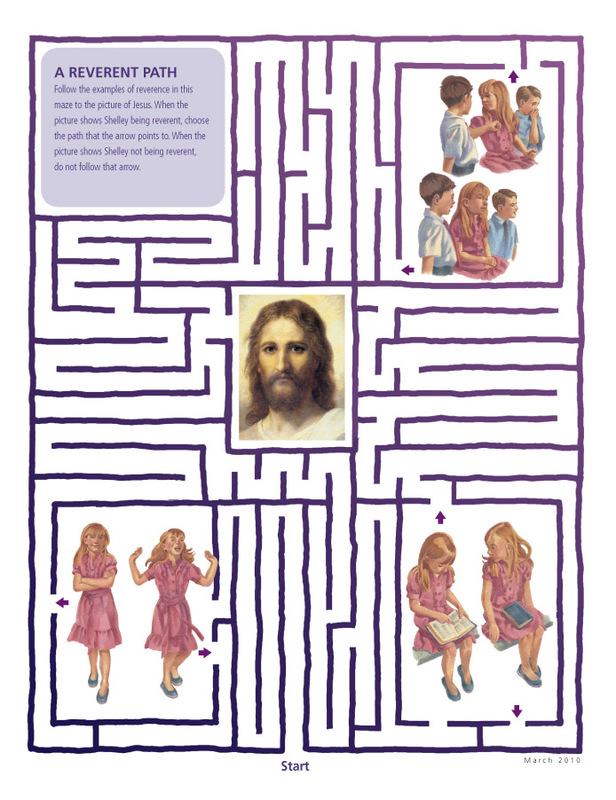 Follow the examples of reverence in this maze to the picture of Jesus. When the picture shows Shelley being reverent, choose the path that the arrow points to. When the picture shows Shelley not being reverent, do not follow that arrow. Illustrations by Dilleen Marsh; Christ’s Image, by Heinrich Hofmann, courtesy of C. Harrison Conroy Co.